When I agreed to build a BMW for the Baja 1000, I knew it would be a mess. In the 50-year history of the Baja 1000, no one had ever entered a BMW. There’s a reason for this. It’s way easier to just weld tubes together than it is to start with someone else’s work and convert it for desert racing. It’s why there’s not one part from a production pickup truck on a trophy truck. If I were smart, I would have done the same with my BMW 325. But that wasn’t the goal. We wanted to build an E30 to compete in the Baja 1000. So why start with a production chassis instead of building a tube frame? Well it all started when I went up to Miller Welders for some meetings and on the second day they asked me to build my “Caswell buggy.” It took me a while of listening before I understood what must have happened the night before. See there’s this guy named Schlesser that built a buggy and won Dakar. The rules heavily favored his design that particular year, but he still won! At night I dream about running a lot of races, but one of my favorites is building a Caswell buggy and running Dakar. Clearly I shared that story sometime later in the night. I also learned that I wouldn’t be running Dakar, but rather the Baja 1000, and they wanted me to build the car on the floor of SEMA. Not only was I denied the prior year for not being “industry,” but I would only have 16 days from the start of the build to the start of the race. Take out the two travel days and I had 14 days to turn a BMW 3 Series into a Baja 1000 racer starting on the floor of SEMA. No matter how difficult it might be, I had to do it. Another friend was more to the point “wow, when you fail, the whole SEMA show will be watching... Wow. Are you concerned? And hey do we get to go to all those SEMA parties?” I have the best friends. Seriously. The next night my friend Matt came by with his Bronco and pulled his 33” spare off. We set it next to the car and my friends started howling. They were right. There was no way in hell I was fitting that giant tire under the car. Screw you guys. I’ll just put it right where it sits... outside the car. I’ll have all the travel I want and it should be easier to build anyway. They kept laughing, but after a while they were like wait, that might work. What do we attach it to? Giant trailing arms of course! I’ll put the subframe where the factory gas tank used to sit. Every trophy truck that I see has the rear suspension attach somewhere mid chassis. We’ll do the same. The laughter stopped until someone said sure man, the rear is easy. What will you do for the front? They had me there. We would have to sort it out along the way. The hardest part of the build wasn’t the one component or the other, but rather how the whole thing would be packaged together. I wanted to run an S50 from a 1995 M3, but the S50 engine is already pretty large and with a bunch of tubing and new steering it would be nearly impossible to build anything like a trophy truck or truggy. Their motors are so far back that the steering is mounted in the center of the chassis(with a center input to the rack) and they sit just ahead of the engine. My steering needed to go under the engine which meant my lower control arms would need to attach under that... like a three story house with nothing but pipes, plumbing and electrical. This was becoming a mess. To complicate things, Miller wanted me to start with a bare e30 chassis. The one thing I did change before starting the build was the oil pan arrangement in the E30. Normally you put a 5 series oil pan on the S50 when you drop it into the E30. I wanted to keep the rear oil sump which tucks it up into the chassis, so I built a new front subframe to make everything fit. I also pre bent the main cage structure at home. Even worse was that I had never seen anything like what I was trying to build. I had never seen a desert racing truck before. I grew up in Chicago. So I looked through tons of websites and finally found this company Kartek. I called them up and this awesome guy named Kevin(I think, maybe Brandon) helped me make sure I had everything needed to build the chassis. $15,000 or so later I had ton of stuff to assemble and bolt onto the BMW. Things like front uprights(which needed to be welded together), a rear subframe and trailing arms, wheel bearing and matching hubs, Wilwood brakes, fancy Porsche CV joints with 300M races, and a ton of bearings and rod ends. The unknown parts were the driveshaft, halfshaft axles, race radio, intercom, seats, and everything else we didn’t know we were missing until we found Strategic Racing Designs, in Vista, CA. The off road stuff was easy in a way. All I had to do was weld some tabs on the frame to attach suspension too. The driveline was more complicated. I needed to connect the BMW engine/trans to Porsche CV’s which are standard in off road, so I looked for a differential that had Porsche outputs. For a while I thought maybe a Cayenne rear diff might work, but that didn’t seem right. I eventually found a Speedway quick change differential which has an option for Porsche output stubs. They have two models, a smaller one for like 300hp cars, and massive one for 800hp cars. I’m sure you can guess which one I bought. It was even larger in person. I remember unpacking it and thinking “how the hell am I going to fit this into an e30 and connect everything?” Kind of like the tires. But I knew I couldn’t carry spares for the diff, so whatever went in the car had to last the 1000 miles. The rear trailing arms showed up next with all the hubs and uprights. Things were looking good! Then I opened some boxes full of plasma cut pieces of steel with a thick tube and a ring plate that looked like it might hold bearing. There were no instructions. This is not something you buy when you’re new to building desert vehicles. I decided not tell anyone and just added them to the parts crate for SEMA. The fuel cell was quickly becoming a problem given the cost of a new cell with a high safety rating. I had been looking online for weeks without much luck when a few days before my deadline a perfect cell showed up on Craigs List. But it was in Los Angeles and they only person I knew in LA was Thuy Dang of Live Sockets. You know all those awesome WRC DVDs we had in the United States before WRC+? That’s Live Sockets. I called him up and begged. I’ll paypal you the cash, all you have to do is pick it up and mail it to someplace to Chicago today! Please. Thanks again Thuy if you’re reading this! Here we are loading the tub into SEMA with a forflift. At one point a ‘76 Ferrari F1 car(replica?) was going in next to us and they were freaking out that our car would fall off the forklift and roll onto theirs! I keep mentioning the 14-day window from SEMA to the start line, but the time pressure was even worse than it appeared. We were only allowed to work from 8:30 till 5 while at the show. I also had to host a morning video and an afternoon video which cut even more into our build time. Then Miller scheduled something like 59 interviews during the 4 days. I barely got any work done. Luckily I brought a few friends to help, but they also wanted to see the show and hit the parties. By the way, that’s Ray Wert(yeah that Ray Wert) taking a picture with Larry Webster while I explain the front end suspension. The other problem was space. I’m used to building in a two-car garage but I have a basement and driveway to put overflow items into. My workspace at SEMA ended up being a few feet larger than the size of the car. I was like where do I stack all the parts? Is there a place I can cut steel? There was nothing we could do about it, so we did our best and the build went very slowly. Our plan was to start with the roll cage, then add the rear suspension, followed by the front, and when the welding was done, we would wire and plumb it all together. Seems easy right? It can be, if you have time. The pre-bent cage went together pretty well on the floor of SEMA. Then we cut out the trunk floor and ran square bars from the main hoop back to the rear bumper area to hold the rear subframe. We did our best to measure it all on the floor of SEMA and keep it symmetrical, but with the limited room and time, we just stuck it in and welded it all together. We bolted on the rear trailing arms and attached the wheels, but now we had to decide where to mount the rear shocks. We took the spring off the coilover and compressed the shock all the way up until we were a few inches from bottoming out the chassis and welded the upper mount in. Another question I get a lot is how did I know what spring rates to order? To be honest I really didn’t. I added up the weight of all the parts I bought. Things like the driveline, the bare tub, steel tubing and was like, I don’t know... 3,400 lbs? Maybe less? 850lbs per corner? I based my rates on those weights and assumed a relatively similar motion ratio of the shock in the front and rear. We had we found the right shop. Justin’s skills are incredible but he was faster at designing, fabricating, and wrenching than anyone I’ve met in my entire life and I’ve been around a lot of race shops. We started working like crazy and were making a ton of progress when Justin was like “I don’t think your cage will pass the SCORE Tech inspection. We need to bring this to them and have them take a look.” Sure enough I was short a ton of gussets and they asked for some extra bars connecting the chassis together. We did exactly what they wanted and went back the next day and earned our Score chassis tag. As for the front suspension, we extended tubes off the front of the cage that went forward to our front bumper and crash structure. We used the lower tubes to attach the lower control arms or “A arms” too and then attached the shocks to the top tubes. We used a “J bar” for the upper arm for packaging and attached that to the forward part of the tubes that connected the upper and lower forward chassis tubes. I studied my old Team Associated RC 10 and realized I needed a steering rack that ended exactly where my control arms started. This way the tie rods stay parallel to the control arms so the steering angles wouldn’t change as I cycled through the suspension. So the entire design was based around the stock E30 rack and while we didn’t measure the bumpsteer, the wheels cycled through the suspension with no visible alignment change! We’ll we had the camber curve we were looking for, but our toe stayed neutral through the whole range of travel which is all I wanted from the front end. The other part of the build that sticks out in my mind was the custom dash to hold our switches, gauges, navigation and radios. We were working late when Justin’s wife, Heather, showed up. I looked at my friends and was like well guess were done working tonight. Then Heather spoke up “I need all your codriving equipment” and grabbed a sheet of aluminum and started measuring to feed it into the break/shear. An hour later we had a dash and everything was mounted. I couldn’t have been more wrong. I later found out that not only can Heather fabricate, but she races as well, and holds a class 5 championship in the DRIVE series. We definitely found the right shop. A husband and wife couple that builds, preps, and races cars! Seriously, when was the last time you saw a husband and wife team passed out in their race gear together after a grueling day? Keep in mind that while we were working 20 hr days leading up to the race, Justin still had to prep his bike and run the Baja 1000 himself. Naturally he won his class that year on a motorcycle. It’s not like he’s new to racing though, Justin used to race Motocross and Supercross for Yahama. Yeah, he’s faster on a bike than he his fabricating which is almost hard to believe. There are so many little details about the build that it would be annoying for most of you to read through them all. If there’s something specific you want to know, ask away in the comments and I’ll do my best to answer. In the meantime, I know a lot of you wanted to know what this whole thing cost. I’ve did my best to remember everything that went into the Baja Pig but these prices are rounded off and are simply a general estimate of the cost. I didn’t look up every last part that went into the car, only the ones I couldn’t remember how much they cost. The list adds up to $31,275 and that’s without labor to SRD. Motorsport is expensive and I choose to build the first BMW for the Baja 1000. I could have easily bought a cheap buggy for $12k and entered the race. It’s generally what I suggest you and your friends want to compete in the Baja 1000. I’m just not made that way, I like to build the weird cars I see in my head, even if it makes no sense and costs a ton of cash. There were also a ton of other costs not included in the build. From buying friends dinner in Chicago to bringing them to Las Vegas(and covering their bar tab) to paying SRD for the final week, it all added up to a lot cash. If I had taken my time and built the Baja Pig in my garage instead of at SEMA I could have saved most of this expense if not all of it. I also would have never made the race without Justin and SRD, but it was still one of the most expensive builds I’ve worked on. I love the Baja Pig and the way it turned out. Hopefully we rebuild it right and finish the Baja 1000 this year! Our goal is to go back and finish the Baja 1000 in a car of my design with my friends. 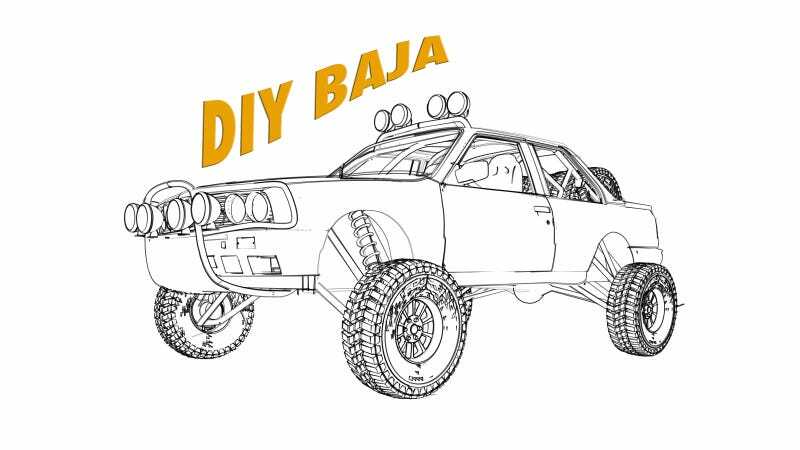 The point of DIY Baja is to show you how you and your friends can do the same thing if you want it bad enough. The Baja 1000 is the longest, largest race in North America, but its also one of the largest grassroots motorsport events in the world. Everyone is welcome to race and you can enter almost any vehicle you want provided it passes safety/tech inspection. Some guys even ran a motorhome a ways back! In the next 4 weeks, we are releasing a ton of videos on the build, prep, and logistics of competing in the Baja 1000. We’re going to take you through rebuild and explain what didn’t work and where and why the chassis failed. We’re going to take you through the offroad suspension car and show you how we rebuild the Bilsteins – I just want to see what’s inside those giant shocks to be honest. Then we’re going testing and hopefully will get the shocks dialed in a little more. The plan is to walk you through everything we’re doing to get ready for the race. We’re also inviting you go come down and join us. You need to be self sufficient. Meaning you need to be able to get around and mange your own food, etc. The plan is for us to run three shuttle vehicles for drivers and one chase vehicle. We could add another chase vehicle but I don’t have cash for two sets of spare parts anyway. Plus the Pig will carry a lot of its own spares and tools. Every driver and codriver has wrenched on the car and helped build it. With luck the team will be able to make their own repairs and keep moving. So while we have the basic infrastructure including BFG for pit stops and Mag 7 for emergency repairs, we could use back up teams. It would be create if every vehicle had a second vehicle following along with it in case something goes horribly wrong. That would mean there’s room for four more vehicles on the primary chase team. You would be a part of the race, but if you got tired or wanted to go watch and drop out, that could work and our team wont be handicapped. For the rest of you, there’s the huge contingency party on Thursday. If you come down Wednesday you can join us for dinner at Santos steak house. Then well have a few places along the course that are good for spectating where various groups can meet up. We also found some handheld radios for $35 that can be used to communicate with the team. You wont be able to broadcast very far but if youre in the right area you’ll be able to track down the rest of the team. I did fail on finding us all a place to camp. My understanding is that Estero Beach resort has a ton of camping on a first come, first serve basis but I’m unable to confirm or secure a spot. Your best bet is to rent an SUV and sleep in the back. Seriously. It’s like camping, but you can lock your stuff up and move it around. We have two hotel rooms for the drivers but there wont be any sleeping on the floor because we all know how that goes. In years past I would have done it, but my friends and I want to be rested this year. There are also DIY Baja shirts you can buy from Teespring at cost. We make no profit on them but the shirts are cool and we wanted you to have one. This is the last printing before the sponsors go on the back. If you want a plain one, you should buy it this week. In the next couple of days, we add 4 Wheel Parts, Amsoil, BFG, VP Fuel, Strategic Racing Designs(SRD), and Build Race Party to the back of the shirt. We’re crazy excited to be working with these companies because we already love and use their products. It’s also the really cool part about watching grassroots sponsors. First off, these are the company’s products you should be buying because they support racers like us. But more importantly, if you see a logo on our car, it’s because we feel it’s the best product for the job and had previously spent our own money to buy it. Plus, as a grassroots team, we never receive enough to comprise our program for a sponsor. We only run the company’s products that we love. For example, I was offered free tires for the race. But I love BFG and we need BFG pit support to compete like we did in 2010 & 2011. So I would rather sleep in the desert and scrap every other part of our program before I would give up my BFG’s. Its not just a sticker on the side of the car. Of all our partners, we’re most excited to be working with 4 Wheel Parts. The owners both race off-road and most of the employees I met were real car guys. The employee parking lot was loaded with enthusiast cars. I love that! Plus we buy a ton of stuff from their retail store and it’s really cool to work with companies that have a great product, yet still get your DIY, grassroots craziness. In the meantime, if you want to join us in Baja November 16-20,or have questions, send an email to DIYbaja@gmail.com. Even better is to join the Facebook Group: DIY Baja were you can interact with others that are coming down and figure out your travel plans. Photos by Bill Caswell, Sam Smith, Curtis Creager, Score-International, and SRD.